Students will be taught in very specific terms what behaviours are expected of them so that there is a consistent response to these ‘desired’ behaviours across the school. 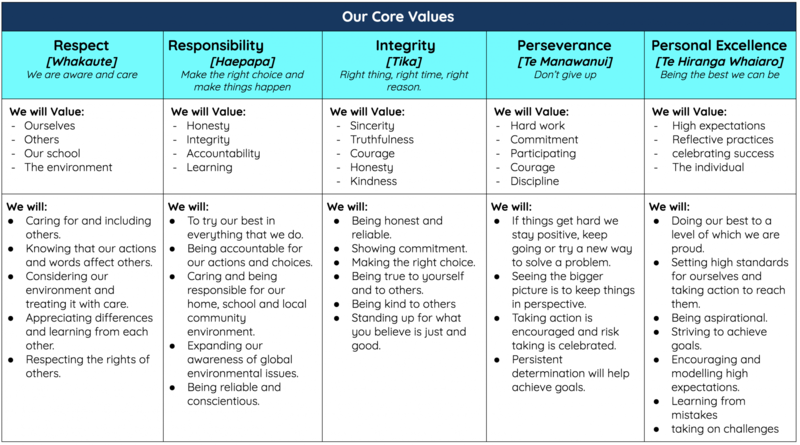 The school-wide values approach focuses less on the individual students as the problem and more on changing the environment around them to support positive behaviours (preventative vs reactionary). It is a customised approach designed to fit the specific cultural and learning needs of every student. Preventing problem behaviours from occurring. Consistently addressing and reducing inappropriate behaviours. Using database assessment and problem solving to address concerns. Strong, visible leadership and commitment from the Principal, the leadership teams and Board of Trustees. Ongoing consultation and engagement with teachers and support staff, as well as the wider school community and whanau. Utilizing ETap (our SMS system) to track incidents and produce reports. This is to ensure decisions are well informed/grounded in evidence, and so progress over time can be tracked. Positively stating clear and concise expectations for all students and staff. To be regularly reinforced and encouraged (through a blend of both intrinsic and extrinsic motivators). Teachers will ensure consistency across the school in the explaining, modelling, practising and acknowledging. A clear set of logical procedural steps to discourage and manage problem behaviour. ENVIRONMENT: Learning environments will be safe, secure, informative, visually stimulating, colourful and reflective of student work - an environment that creates connections and a true sense of belonging. Teachers will ensure environments are well organised and encourage student participation and voice in the ongoing care and presentation of their classroom. 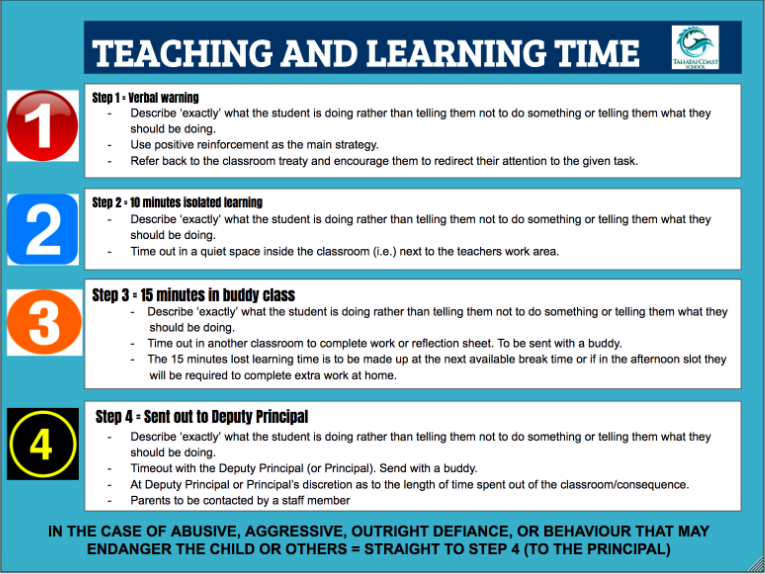 Each classroom is to co-construct a ‘behaviour treaty’ with students, establish clear routines and regularly share expectations. RELATIONSHIPS: Building of relational trust between teacher-student and student-student (as well as with whanau/parents). Through shared values, teachers modelling learning (AKO) and empathy, being readily available, following up with promises, regular encouragement to build self-esteem and where humour is used to create a sense of fun and enjoyment. Relationships are to be fostered through honesty, support and the regular celebration of success. LEARNING FOCUSED: Programmes are informed through reflective practices and assessments and cater for individual student learning and cultural needs. Teachers embrace differentiated learning strategies, encourage students to take greater ownership of their learning (building levels of learner agency), and promote high expectations. The 6 We Live and We Learn behaviours (Competencies) are integrated into all areas of learning. Programmes are designed to engage, excite and promote higher order thinking. REWARDS: Positive praise recognizing progress and achievement against each of the school’s values and the We Live and We Learn behaviours will be part of everyday life at Tahatai Coast School. All staff will continue to reinforce desired behaviours by timely feedback, positive interactions and consistent recognition. Facilitate shared learning and collaboration. Make connections to prior learning experiences. Inquire into the teaching and learning relationship. NB: The above shows the TCS Essential List of ingredients that promote positive learning experiences for all. Acknowledgements of positive attitudes and behaviours will be part of everyday life as a means to promote and recognise examples and modelling of desirable behaviours. Behavioural consequences are used as the link between rights and rules, and subsequent accountability. Consequences are to be fair and reasonable in relation to the degree of seriousness of the behaviour. They are to be applied with fairness and respectfully and to be used as a tool to ‘teach’ the student that all behaviours have consequences. We speak kindly and respectfully. We speak kindly and respectfully to each other. We co-operate with others. We share the playground and learning resources. We walk quietly in our room and put things away carefully. MOVEMENT We take care when we are moving about or playing outside. We look after our equipment. We are kind to each other. We play friendly games. We talk to each other and try to work problems out. If we need help we ask a peer mediator or teacher. We try not to hurt people. We use equipment safely. SAFETY We play safe games. We play in safe areas of the playground. NB: TEACHERS TO USE THIS AS A GUIDE ONLY WHEN CO-CONSTRUCTING THEIR CLASSROOM BEHAVIOUR TREATY. Benching is used only as a consequence during break times. 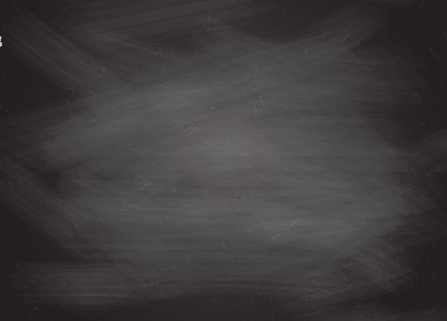 The purpose of which is to defuse a situation and allow a student time to reflect on their actions. A student whose behaviour is deemed as ‘level 1’ will not be benched. Instead they will be praised for using the mediation process. The benching area is the seated area closely supported through staff supervision. Or when there is concern that interventions are not redirecting inappropriate behaviours. This is best communicated face-to-face or by phone. Teachers on duty will be responsible for reporting all serious misbehaviours to someone from the leadership team (Principal, DP or AP) and may be asked to enter the issue on to ETaP if a child is benched. This will record the date, name and behaviour. 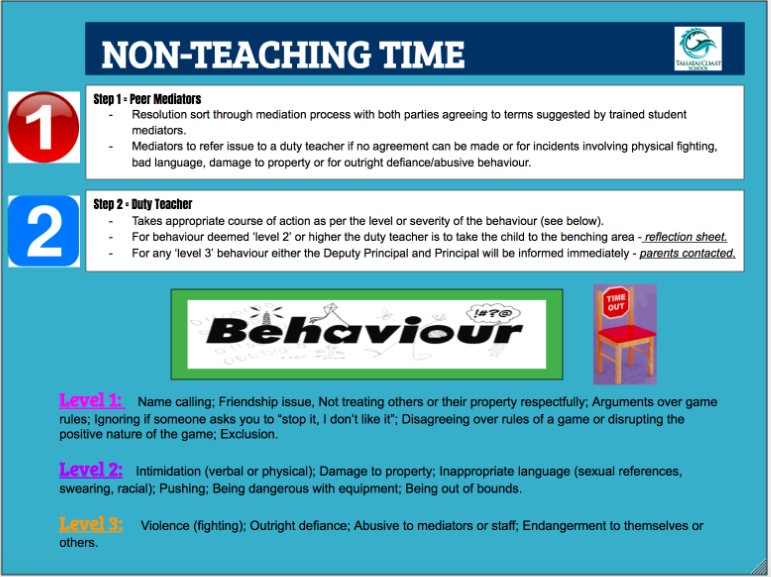 Students who are benched will be required to complete a behaviour reflection sheet and take this home for parents to sign. Behaviour sheets will be returned the following day to the school office for final sign off by the Principal or Deputy Principal. SENCO: This committee, made up of largely leadership staff is available for staff to seek support, guidance, make referrals, or to work as a liaison between outside agencies and the school. Staff, parents and caregivers are not to feel alone or unsupported when experiencing difficulties with student behaviour. Music and various equipment available. Library open at break times. "It is important to be kind to others"